safer roads, stronger communities and a Bicycle Friendly America. Through information, advocacy and promotion, we work to celebrate and preserve the freedom cycling brings to our members everywhere. The League’s Bicycle Friendly America℠ program provides a roadmap, hands-on assistance and recognition for states, communities, universities and businesses. The BFA program is a tool for states, communities, business and universities to make bicycling a real transportation and recreation option for all people. The annual National Bike Summit is a gathering of advocates, professionals, researchers, and individuals to advance one goal - creating a Bicycle Friendly America for Everyone. Every year we meet to take action, share best practices, and share stories about bicycling in America. This unique event brings the grassroots of bicycling to Washington DC to make their voices heard and support continued federal support for biking and walking. Education has been a core activity of the League’s since the late 1970s. The League ran the program for more than 20 years, before evolving the education program into today’s Smart Cycling program – following basically the same principles – with a significant growth in the number of instructors. From the halls of Congress to the streets of your community, the League is working to make biking better for you. We are the voice of the nation’s 57 million bicyclists, promoting and protecting your right to ride. Our advocacy efforts span the spectrum, from lobbying Congress for our fair share of funding to giving local advocates the tools to win campaigns for bike-friendly policies in your town. Since 1880, we have been the hub of information that get the wheels spinning in communities nationwide. Imagine the transformative effect that a national support network can give to both established and budding local advocacy groups all across the country. The Active Transportation Leadership Institute can be that catalyst for transformation: a gathering place, a classroom, and a place to share resources with one goal - advancing biking and walking from coast to coast. In 1880, cyclists formed the League to demand paved roads, signing their names on a massive wheel that was presented to Congress. While our methods have changed, our vision is the same: uniting cyclists to make biking better. Your membership dues power all of our time-tested programs: the bike-boosting Bicycle Friendly America, our deep understanding of federal transportation policy and how it is made, the Smart Cycling bike education program, our equity and outreach programs, and our support for local clubs and advocacy organizations in all their efforts to make your ride better. Find events, classes, bike shops and more. Here at the League, members are at the core of every program, every initiative, every action. Imagine your community with more trails for people biking and walking. (or Renew here!) Join the growing movement of cyclists united for better biking. 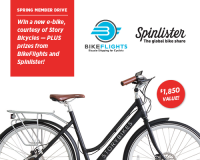 During the month of April, all new members will be entered to win a new E-bike, courtesy of Story Bicycles!